A JSlider component is intended to let the user easily enter a numeric value bounded by a minimum and maximum value. If space is limited, a spinner is a possible alternative to a slider. Click the Launch button to run SliderDemo using Java™ Web Start (download JDK 7 or later). Alternatively, to compile and run the example yourself, consult the example index. Use the slider to adjust the animation speed. Push the slider to 0 to stop the animation. Below is the code from the SliderDemo.java file that creates the slider in the previous example. //Turn on labels at major tick marks. By default, spacing for major and minor tick marks is zero. To see tick marks, you must explicitly set the spacing for either major or minor tick marks (or both) to a non-zero value and call the setPaintTicks(true) method. However, you also need labels for your tick marks. To display standard, numeric labels at major tick mark locations, set the major tick spacing, then call the setPaintLabels(true) method. The example program provides labels for its slider in this way. But you are not constrained to using only these labels. Customizing Labels on a Slider shows you how to customize slider labels. In addition, a slider feature allows you to set a font for the JSlider component. Notice that the stateChanged method changes the animation speed only if the getValueIsAdjusting method returns false. Many change events are fired as the user moves the slider knob. This program is interested only in the final result of the user's action. The source for this program can be found in SliderDemo2.java. 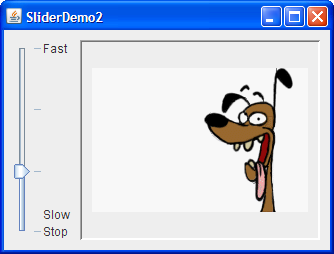 Click the Launch button to run SliderDemo2 using Java™ Web Start (download JDK 7 or later). Alternatively, to compile and run the example yourself, consult the example index. Each key-value pair in the hashtable specified with the setLabelTable method gives the position and the value of one label. The hashtable key must be of an Integer type and must have a value within the slider's range at which to place the label. The hashtable value associated with each key must be a Component object. This demo uses JLabel instances with text only. An interesting modification would be to use JLabel instances with icons or buttons that move the knob to the label's position. Use the createStandardLabels method of the JSlider class to create a set of numeric labels positioned at a specific interval. You can also modify the table returned by the createStandardLabels method in order to customize it. The following tables list the commonly used JSlider constructors and methods. See The JComponent Class for tables of commonly used inherited methods. JSlider() Creates a horizontal slider with the range 0 to 100 and an initial value of 50. JSlider(int min, int max, int value) Creates a horizontal slider with the specified minimum and maximum values. The third int argument, when present, specifies the slider's initial value. JSlider(int orientation, int min, int max, int value) Creates a slider with the specified orientation, which must be either JSlider.HORIZONTAL or JSlider.VERTICAL. The last three int arguments, when present, specify the slider's minimum, maximum, and initial values, respectively. 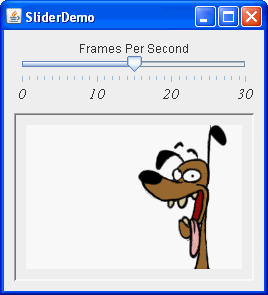 JSlider(BoundedRangeModel) Creates a horizontal slider with the specified model, which manages the slider's minimum, maximum, and current values and their relationships. int getValue() Sets or gets the slider's current value. The set method also positions the slider's knob. int getOrientation() Sets or gets the orientation of the slider. Possible values are JSlider.HORIZONTAL or JSlider.VERTICAL. boolean getInverted() Sets or gets whether the maximum is shown at the left of a horizontal slider or at the bottom of a vertical one, thereby inverting the slider's range. int getMaximum() Sets or gets the minimum or maximum values of the slider. Together, these methods set or get the slider's range. int getMinorTickSpacing() Sets or gets the range between major and minor ticks. You must call setPaintTicks(true) for the tick marks to appear. boolean getPaintTicks() Sets or gets whether tick marks are painted on the slider. boolean getPaintLabels() Sets or gets whether labels are painted on the slider. You can provide custom labels with setLabelTable or get automatic labels by setting the major tick spacing to a non-zero value. Dictionary getLabelTable() Sets or gets the labels for the slider. You must call setPaintLabels(true) for the labels to appear. Hashtable createStandardLabels(int, int) Creates a standard set of numeric labels. The first int argument specifies the increment, the second int argument specifies the starting point. When left unspecified, the starting point is set to the slider's minimum number. setFont(java.awt.Font) Sets the font for slider labels . void addChangeListener(ChangeListener) Registers a change listener with the slider. boolean getValueIsAdjusting() Determines whether the user gesture to move the slider's knob is complete. BoundedRangeModel The interface required for the slider's data model. DefaultBoundedRangeModel An implementation of the BoundedRangeModel interface. (in JSlider) Sets or gets the data model used by the slider. You can also set the model by using the constructor that takes a single argument of type BoundedRangeModel. This table shows the examples that use JSlider and where those examples are described. SliderDemo This section Shows a slider with labels at major tick marks. SliderDemo2 This section Shows a vertical slider with custom labels. Converter Using Models, How to Use Panels A measurement conversion application featuring two sliders that share data and have custom BoundedRangeModels. If you are programming in JavaFX, see Slider.